Thai silk’s uniqueness lies in its strength from solid, yet delicate silk threads and vibrant colours with glossy surfaces. Those who have witnessed the fabric’s exquisite allure are inevitably mesmerized by its unforgettable charm. Thai silk is the portrayal of luxury reserved exclusively in ceremonies such as religious rites and weddings. This splendor requires artisanal skills and expertise while its beauty is conveyed through a sophisticated process and exceptional delicacy beginning from the stage of colouring, spinning to weaving the threads into marvelous silk. Looking back, the art of silk weaving belongs to an ancient culture of the Khmer people who migrated to Thailand in the early Rattanakosin era. The significant change of Thai silk, however, took place in 1955 when James Harrison Wilson Thompson or Jim Thompson who was on his journey throughout Thailand for the ideal Thai silk. He visited Baan Krua, a small weaving community of 8 families in Bangkok to buy a piece of sarong. He was immediately impressed by the marvelous silk from the stunning skills of Baan Krua residents. Time passed, and 8 houses shrank down to only one which still operates as the silk-dyeing and weaving factory. This house belongs to Uncle Ood who has maintained his profession a silk-dyeing artisan during these 62 years. 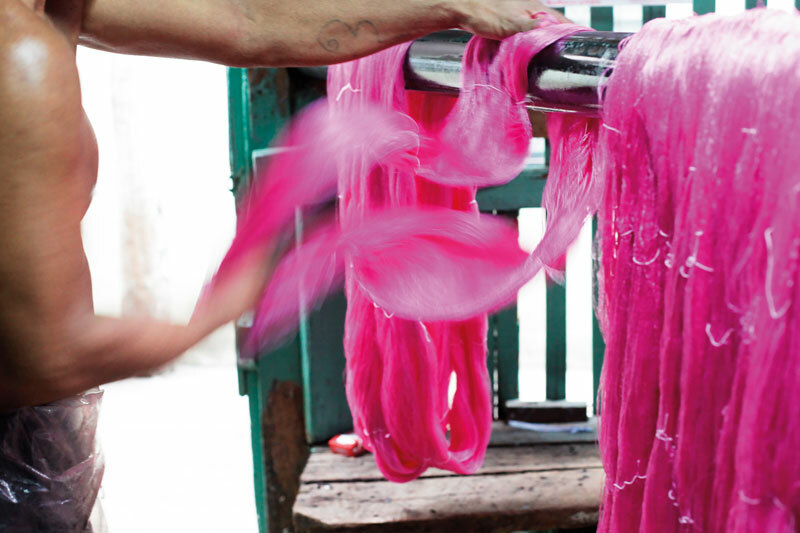 Baan Krua community, the pioneer of Thai silk, is recognized as one of the best Thailand destinations for best Thai silk. It is also the true force behind Thai silk’s global reputation. In the late 1950s, producers of the legendary Hollywood masterpiece film Ben-Hur had commissioned Jim Thompson to produce costumes for the movie’s main characters with Thai silk. All the costumes featured in the film were then woven from the villagers’ artisanal skills despite owning only two silk-dyeing factories. Uncle Ood has opened his workshop to visitors for more than 15 years. This house means the last lineage preserves and continues the silk weaving and dyeing tradition of Baan Krua, the legendary Thai silk community with the global reputation. As the family’s pillar, Uncle Ood has vowed to introduce outstanding patterns and original exquisite colour shades consistently.